If you scrolled through any social media platform, walked into a newsagent or glanced at a fellow commuter’s reading material earlier today, you can’t failed to have noticed how one image dominated this morning’s front pages, which read like a Media Studies textbook in “how one picture can change everything”. The protagonist in this most sorry of tales was a child. He can’t have been more than four years old; that was perhaps the most painful, tragic element to all of it. 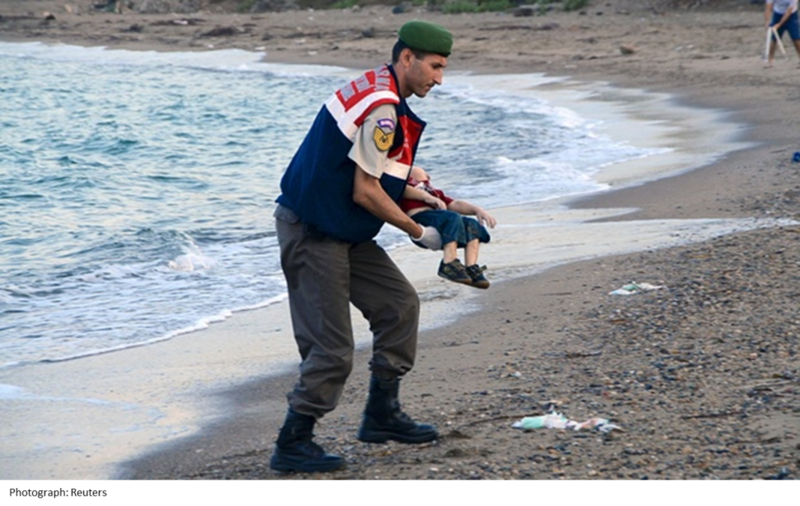 The image of a young Syrian boy washed up on a beach in Turkey, having travelled with his family from Syria to seek refuge, to escape to a new, better and safe life. It was a photograph that, as many do these days, emerged online before finding its way to traditional media. Since the beginning of what has been classified the ‘migration crisis’, a significant number of UK papers have been pretty fierce critics of immigration and those seeking asylum (two very different groups of course); that was until this photograph hit their picture desks. The photograph now graces almost all the front pages in the UK and has sparked a shift in how papers are reporting on the ‘crisis’. As is evident, the picture has had a significant influence on the way many have been reporting on the “migration crisis” swapping the term ‘migrant’, which previously encompassed both financial immigrants and asylum seekers, with the term ‘refugees’ . Even The Sun, previously no big fan of migration, has called on the Government to accept refugees from Syria. The Sun remains an important bell-weather of public opinion and they have clearly decided that their readers will not stand to see young children affected so powerfully by the “migration crisis”. The reason this photograph is so important, not least because of its tragic nature, is that it may well become a clear marker in a graph that highlights how public opinion changed on the subject of migration. The crisis in Europe has dominated the news agenda for some weeks now, but for those who keep track of these things, this is the first time that “outrage” and “anger” have been words used in the national press. The crisis in Europe is incredibly complicated, and short-term solutions are few and far between. However, when governments sense that the public are angry and are demanding immediate answers, it’s remarkable how quickly they can act. The fact that one single photograph can cause that anger, and potentially lead to action, speaks volumes about the power of images, not words, in a crisis like the one currently engulfing Europe.